Bonsai Games has partnered with Game Salute’s Springboard program to launch their first major release, Ruse. Today we take a few minutes to sit down with Ruse’s designers and co-owners of Bonsai Games, Levi Mote and Sarah Sharp. Sarah, Levi, first of all thanks so much for taking some time from your schedule to answer some questions for us! Can you tell us how you decided to work together on RUSE? LM – Thanks for taking the time to talk about Ruse with us. It really is one of the most special things we’ve ever collaborated on. SS – I will also thank you Jeremiah for wanting to talk with us. We’re always excited to share our games with anyone who’s interested. In addition to what Levi has already said, we’re very lucky that we collaborate so well and that we share the same passions and interests. It really is a perfect partnership both personally and professionally. So, whose brainchild was RUSE? And how did the idea first comes to you? LM – Growing up, my mother’s favorite board game was always Clue. One day Sarah and I were having a conversation about what we liked and didn’t like about that game. I wanted to design a murder mystery game that went beyond deducing what was in an envelope. The best part of Clue is in choosing what to show the other players and using what you know about other people’s cards to deduce what they have learned from a guess. We decided that the most fun way to convey a murder mystery was to allow the players to make accusations against each other and keeping the truth about the murder a mystery right up until the very last card played. SS – Let’s be completely honest here…Ruse came from an early morning conversation while Levi was in the shower and I was doing my hair. He had been thinking about Clue and we just got to talking. By the time he was toweling off we had the basics of the game laid out, along with a few mechanics. It’s been a very fun and relatively easy endeavor ever since. Levi, Ruse is not your first game design; is Ruse the first title you’ve co-designed? How was this experience different than flying solo? LM – I’ve designed several games and as the super-supportive-love-of-my-life she is, I’ve always collaborated with Sarah to some degree. This game in particular was much more a partnership as we worked out the nuances of a storytelling game. 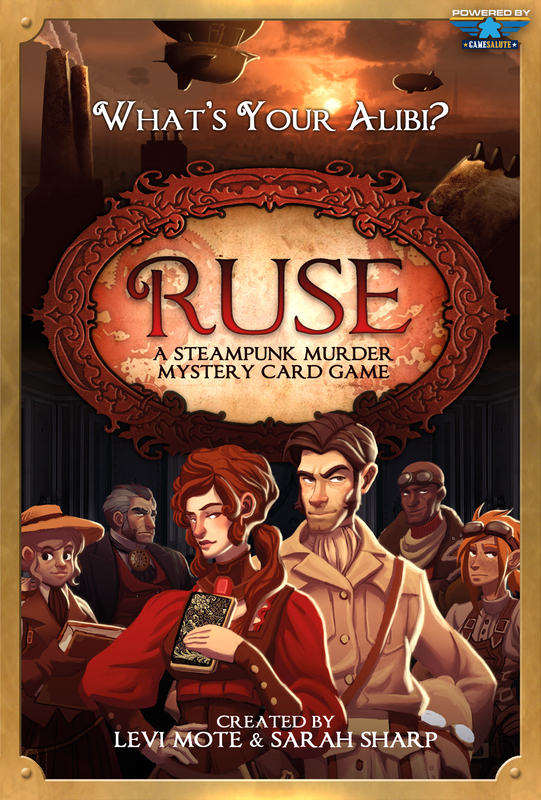 Ruse, more so than most games, had to be more than a collection of mechanics; it needed to evoke a feeling of having your back against the wall and scrambling to pin the murder on someone else before it got pinned on you. As a writer, evoking that feeling from the audience is more along her line of expertise. Sarah, if I’m incorrect, please tell me, but this is your first experience in game design; tell us a little bit about the experience and working with Levi. SS – Well, I’ve been exposed to game design since Levi and I got together. I’ve seen all the steps from an outside point of view and have always been, along with a few close friends and family, a sounding board for ideas as well as an avid play tester. This was the first game I’ve really been able to get my hands dirty with and have loved every minute of it. Levi is very gifted when it comes to thinking up premises and working out mechanics. I love being able to come in and help him flesh out story elements and the like. What is your favorite element of the game? LM – I love that you don’t know who will go down until the last card is played. I love that even in losing you get to be a star and give your dramatic explanation of why you had to do it. SS – I love the interaction between players and how they really get into the descriptions on the cards. I also love the versatility of the cards themselves. Since Ruse is built on a traditional 54 card deck (Jokers included) it’s easy for anyone to pick-up and can be a “gateway” game for those who aren’t hard-core gamers. I’m also a sucker for Kelly’s art…it’s amazing. Give us your top 3 games and why? Risk – Secretly I want to rule the world. SS – Rune Wars – It’s totally epic and I love fantasy. We Didn’t Playtest This At All – We just got this and it’s so addictive! Always looking forward to playing it! 7 Wonders – The scoring is crazy, but the mechanics are stellar. I just wanted to note that a top 3 isn’t fair…a top 20 would’ve been more like it! Ruse is a game of accusations; ever accuse anyone of a murder? How’d that work out? LM – Who told you about that?!? The FBI said the Witness Protection program was airtight! Tell us a little bit about the relationship between Bonsai Games and Game Salute; how did the two come together on Ruse? LM – I approached Game Salute through Springboard. I was looking at self-publishing some games using Kickstarter for funding and I kept seeing these “Springboard Approved” games funding successfully. I emailed them and got a reply from Dan Yarrington to call him the following day. Dan left a meeting to take my call and we talked for over an hour about why we loved games. They looked through our portfolio and picked Ruse as a project they wanted to get involved with. SS – Yep, what he said. Oh, I will add the Game Salute has been awesome and that it was wonderful to see Levi be able to concentrate on just designing great games and not suffer the headaches of production and distribution anymore. At the end of the day, when all the games are back on the shelf, what matters most to you? LM – Family, I think we all define what that word means to us in different ways. Games bring families together and if we can help do that even one night a week; I’m doing work I can be proud of. SS – I second that notion, except I would add friends to the mix too. There is something about face-to-face interaction around a game table that just makes life better. Like Levi said, it brings our family together and we have met amazing people through sharing this hobby and in return have made some really great friends and made other friends into family. It’s incredible, really. Ruse will be crowd-funded through Kickstarter; what would you say to a potential backer who may be on the fence right now? LM – There are few things cooler than watching multiple generations play a game together and this game appeals to multiple generations. SS – Get off the d**n fence and pledge already! We’ve play tested this game with hard-core gamers, people who hate games, even random people in airports! Everybody loves it and you will too. Do yourself a favor and get two or three copies, because someone’s going to “borrow” your copy and it’ll never come back. Yeah, it’s that good! Now for our favorite feature of the interview: Answer the next questions with a single word or phrase! Your answers will speak for themselves! Dr. Strangelove or Dr. Who? Who wins the fight, a Jawa or an Ewok? SS – Ewok – they won the Battle of Endor! We would like to thank Levi and Sarah for taking some time to chat with us about their upcoming game! You can check out their Kickstarter campaign here! Check back for a review soon!